May 30, 2014 at 10am Battle of Big Sandy Program at the South landing (more info coming soon). The gravestones at Barnard/North Road Cemetery will be repaired this year as well as Pioneer/Goodenough Cemetery. Stevens Cemetery was restored. Artisian Engraving was hired to fix the many gravestones that were fallen down or broken. Two gravestones were repaired in Noyes Cemetery. The farm book 2012 documenting farming in Sandy Creek/Boylston is complete. There will be no second edition. As you travel north on Route 11 (The Old Salt Road) and cross into the town of Sandy Creek, a marker has been placed on the Rohrmoser property which was the site of Col. Meacham’s Big Cheese. One hundred seventy four years ago Meacham sought to bring fame to his hometown by creating a big cheese that was to be presented to then President Andrew Jackson. Meacham was one of the most progressive farmers of his time and he constructed a mammoth press and hoop and poured the curd processed from the milk of his 150 cows until he had a cheese which weighed 1,400 pounds. The day the cheese was moved, Meacham obtained the loan of 48 gray horses which he decorated with the National colors and placards advertising Sandy Creek as a cheese making center and headed for Pulaski where the procession halted for public viewing. It was loaded onto a canal boat and began the journey to Washington. His plan called for loading the cheese on a boat at Fort Ontario, transport it to Oswego and thence down the Oswego Canal to Syracuse and onto the junction of the Oswego and Erie Canals, and then to Albany via the Erie Canal and down the Hudson to New York from which it would travel the remainder of the way to Washington on the Atlantic Ocean and Potomac River. President Jackson accepted the cheese which was shared with the public in celebration of the anniversary of the birth of George Washington on February 22, 1836. Today Carol Rohrmoser lives in the house she and brother, Grant grew up in. Their parents, John and Francis Rohrmoser moved from Pine Camp in 1941 and purchased this 500 acre farm which had been vacant for three years. The property crossed Rt. 81 at one time and today is smaller in size but plays such an important roll in the history of our town. Grant remembers taking down an old Elm north of the property that could shade as many as 150 cows. See the historic marker in "photos from the archives"
The Lacona Depot was the hub of village activity for more than a century. The Rome, Watertown and Ogdensburg (RWO) Rail line was completed through East Sandy Creek (Lacona) in the spring of 1851. The depot opened in November of 1872. In 1891 the New York Central & Hudson River Railroad purchased the RWO and replaced the original depot. One of the factors that materially contributed to the prosperity of the town was the entrance of the RWO Rail line through Lacona Village. With better facilities in transportation, new enterprises were encouraged and industries were introduced. The area’s two largest industries, Blount Lumber Company and Corse Press, utilized the train station for their products as did local farmers and both post offices. Salisbury House served as a temporary home for many of the towns’ early settlers and the first town meetings were held there in 1825. This temperance house was the outgrowth of the inn “part frame, part log” kept by James Hinman as early as 1812, when there were only two or three frame houses in what is now Sandy Creek Village. By 1820, it is known that Nathan Salisbury had already established his inn on this site. It burned in 1884. A tannery was one of the oldest industrial sites in the village (1826) and later became the site of the Sandy Creek Wood Manufacturing Company. The precursor to today’s paper plates were made there and furnished employment to a large number of men. It was located behind the Salisbury House. A Local Government Records Management Improvement Fund Grant was written in February of 2009 and we have just received word that we were awarded grant money for a power point project which will showcase the history of this town and its villages through photographs and oral history. With the use of historic records and photographs, historian Cole will educate school children, civic groups, local residents and researchers of the rich history of the town and “twin villages” of Sandy Creek. The addition of their picture and voice will add to the presentation and give a “familiar face” to history. This is especially true for the veteran segments. While memories make for great “oral history” part two will concentrate on “the historic, documented facts” using local government and historic records. "A very successful and memorable event!" 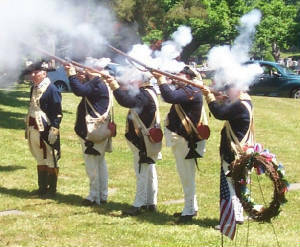 Revolutionary War Interpretive Unit to Dedicate Soldiers Resting Place! Saturday, May 31, 2008 we will remember and dedicate the burial place of two Revolutionary Soldiers, Stephen Lindsey and Jonathan Thrasher at Pioneer/Goodenough District Cemetery on Henderson Road (off NYS Rt. 3). 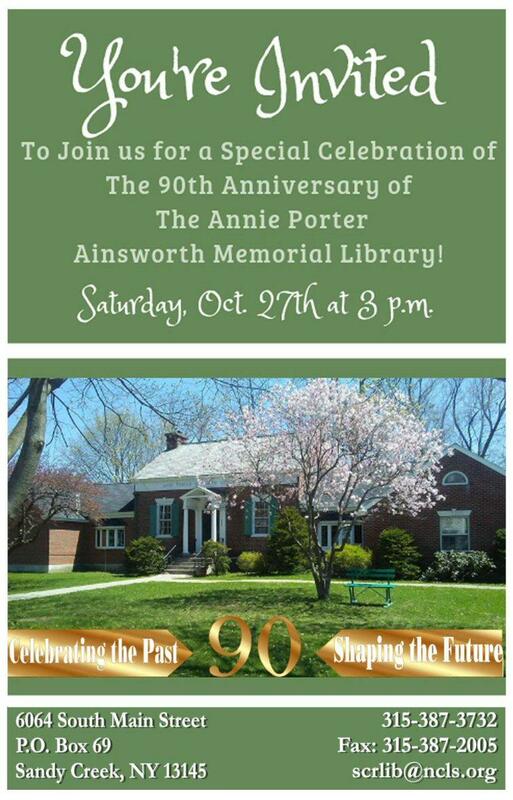 May 31st is the actual Memorial Day and we hope you can join us at this important memorial dedication. The Continental Arms Collectors Association’s Revolutionary War Interpretive Unit, headed by George Clark, reflects a company from the 1st NY Regiment, Continental Army circa 1782. They use 1779 Regulations for the Order and Discipline of the Troops of the United States and they offer a first hand glimpse of our Nation's colorful military history. The Continental Arms Collectors Association, Inc. was founded in 1982 as a Not-for-Profit educational organization. The mission: “to enhance public knowledge on the significance of firearms in American History.” The Revolutionary War Interpretive Unit was introduced in 1992 to further educate the public about daily life in the Continental Army. Extensive research culminated in the selection of accurate reproduction weapons, accoutrements, equipment, headgear, footwear, and clothing in use by the unit. The high standard for the group’s accurate performance of military drills and ceremonies, in use by the Continental Army during the latter part of the War of Independence, is a result of the intense training the unit is committed to. The ceremony begins at 11am and will be under 1 hour. Other participants include the VFW and the DAR. Local family members from Sandy Creek, Florida, Michigan and Maryland will be in attendance.